Notes are bits and pieces of text that you can re-use from one portfolio page in another. 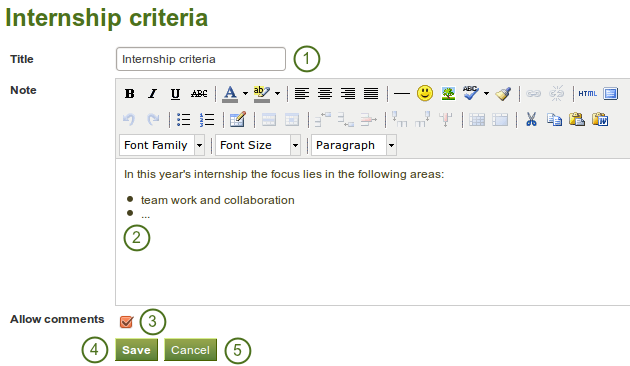 These are the text boxes that you could not save in versions prior to Mahara 1.5. Though you cannot create notes directly from this page, you can edit your notes and their content will be changed wherever that note is used. The Note column contains the titles of the notes where they appear for the first time. The Contained in column lists all the pages in which this text box is used. Click the Edit button to make changes to the note. Beware that any changes you make here are made to all instances of the note. Click the Delete button to permanently delete the note. This action cannot be undone and all instances of the note are deleted from portfolio pages. You can edit your notes to make changes to them. When you make changes to a note from this page, all instances of this note on any portfolio page will be affected. Title: The title of your existing note is displayed. Note: The content of your note is displayed. If you make changes here, they will be applied to all instances where the note appears. Allow comments: Tick this check box if you want to allow others to leave comments on your note. You can watch a demo of this feature in action.